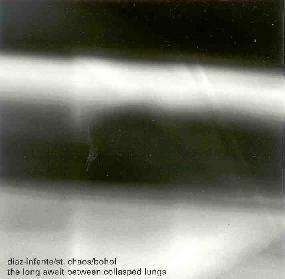 Diaz-Infante/St.Chaos/Bohol - "The Long Await Between Collapsed Lungs"
Free-improv guitarist Ernesto Diaz-Infante teams up with Texas based guitarists Pablo St. Chaos and Bohol. I've never heard of Bohol, though according to the Lo Bango web site he plays with Pablo in Chaos & the Addiction. But in AI #21 Brian reviewed one of Pablo's CD's which he compared to Labradford, Flying Saucer Attack and Charalambides. The Long Await Between Collapsed Lungs is a trio guitar fest with Ernesto on prepared guitar and vocals, Pablo on acoustic guitar, and Bohol on electric guitar. Other than a few very brief tracks the CD is made up of 10-20 minute pieces that allow the musicians to develop their soundscape excursions utilizing noise, drones, string manipulations and various effects. This kind of music needs time to stretch out so it's no surprise that the lengthier tracks are the highlights. On "Death Valley; Restless, Tired", the acoustic guitar sets a repetitive dissonant strumming pattern while the electric guitar creates trippy effects and Ernesto produces his usual adventures into sound. I like the machine shop effect that sounds like various power tools, which along with the lo-fi ambience makes for a drifting but busy piece. "La Cosa Pasada en la Noche" consists of swirling and scratching string manipulations and percussive patterns, along with a lazy valium laced vocal style that makes for an interesting marriage of psychedelic and experimental free-improv elements. "Still Endless & Drawn Out Toward You" features a pulsating, slowly evolving wall of ambient drone that initially dominates the piece. But it soon combines with an eerie strumming Blues guitar to create a fuller and strangely trippy sonic landscape against which various noises and manipulations provide the color, character, and variety that propels the piece for its 20 minute length. Finally, "Sans Division" is an intense, freaked out take on psychedelic Blues put through the experimental noise-drone meat grinder. Simultaneously exciting and tiring, this was my favorite track of the set. In summary, this is a richly textured set of soundscapes that does an impressive job of bringing together the psychedelic noise-drone and experimental free-improv realms. It's always a challenge to make sound textured pieces that hold the listeners attention for lengths of time, but The Long Await Between Collapsed Lungs succeeds to large extent due to the variety of sounds and effects that build upon, and give shape to, the soundscape portions of the music. Contact via snail mail c/o Pax Recordings; PO Box 591137; San Francisco, CA 94159-1138. Visit the Lo Bango Sound web site at: http://www.lo-bango.com.